Johnny Depp was named People magazine's "Sexiest Man Alive" for the second time this decade. Depp -- who first earned the moniker in 2003 -- inherits the title from Hugh Jackman. Other stars who have won twice include Brad Pitt (2000, 1995) and George Clooney (2006, 1997). Says actress Isla Fisher, "Johnny Depp has magical powers. He's funny, generous and clever. It's just a shame he's so hard on the eyes." The 46-year-old father of two has survived 25 years of show business. 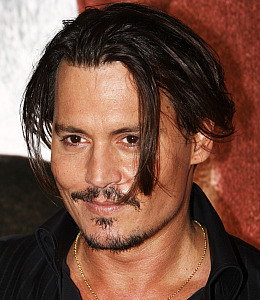 When not starring as Captain Jack Sparrow in the "Pirates" franchise, he spends time with his family in France or on their private Bahamian island. False rumors surfaced Tuesday that Robert Pattinson would be named the "Sexiest Man Alive."